What pasta is to Italians is what dal is to Indians. It’s a staple across the country and when accompanied with rice it’s a dish considered to be the “bread and butter” of the cuisine. My cousins in India find my love of lentils a little odd. They often roll their eyes when their respective mothers tell them that “dal is for dinner”. In fact if you asked my cousin Sahil what he thinks of lentils his response is a facial expression akin to that of the straight faced emoticon (yeah the one that has a horizontal line for it’s lips). He’d rather have a “McMaharaja” burger than masoor dal which is fair enough (Maccy D’s in India is pretty great) but I just don’t think he is giving it the chance it really deserves! For me, dal is quintessentially Indian. One of my fondest memories when spending summer holidays in India, was the sound of pressure cooker whistles going off at lunchtime throughout the neighbourhood. The aroma of pulses cooking away would fill the streets and I would immediately feel hungry. 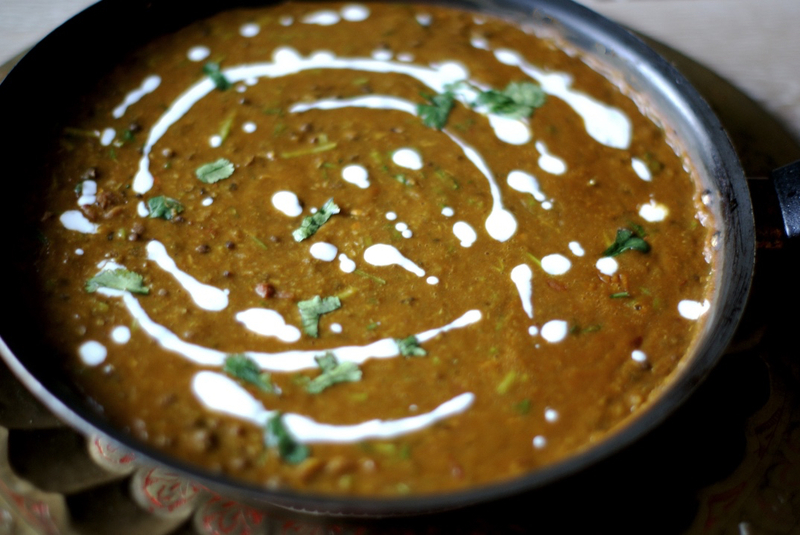 From moong and masoor to toor and channa, each household has their favourite dal and unique way of preparing it. I love how the amazing variety of lentils can result in endless flavours and dishes! Place the urad lentils, kidney beans and channa lentils together in a bowl and soak in water overnight. Rinse and keep aside. 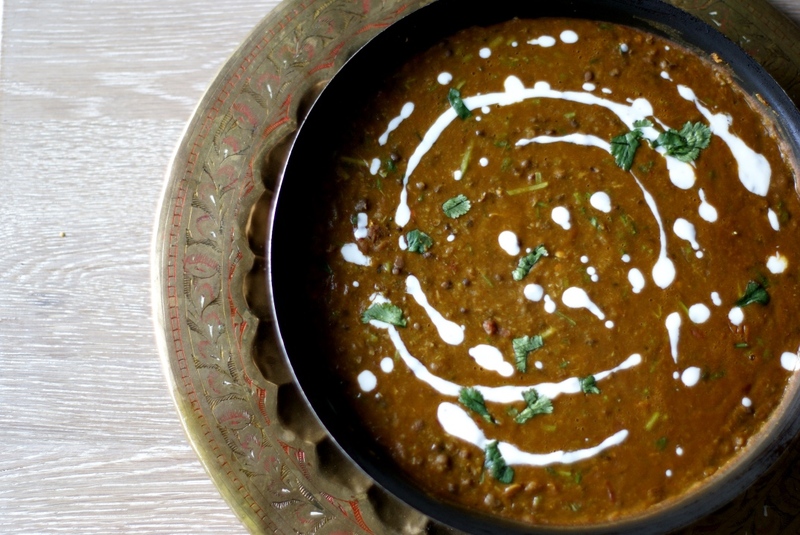 To a pressure cookery, add the soaked lentils, onions, garlic, peppercorns, cloves, black cardamom, bay leaf, cinnamon and salt along with 4 cups of water. Carefully place the lid on the cookery and place on high heat. When the first whistle goes off, reduce to low heat and cook for an additional 15 minutes. Allow the steam to escape naturally before opening the lid. Mash the lentils using a masher until they are blended together. If you do not have a pressure cooker, place above ingredients in a sauce pan along with 5 cups of water and cook until lentils are tender. (This will take approx 45 minutes). If the water reduces before they are cooked, add more throughout. Once cooked and mashed, keep aside. Heat ghee in a non-stick pan. Once hot, add the cumin. When the cumin begins to splatter, add the ginger and for 2 minutes until slightly brown. Now add the tomatoes along with the chillies. At this point, add the coriander powder, chilli powder, garam masala and fresh coriander. Cook for 2 minutes. 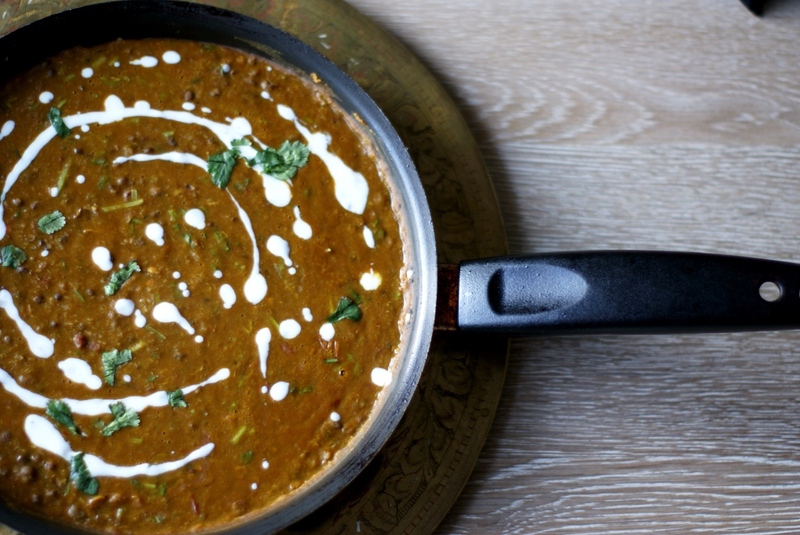 When you see the oil separating, add the lentils and cook on low heat for 10 minutes, stirring regularly. Add cream and cook for another minute. Check for salt and adjust accordingly. Turn off heat. Kheer, also known as Indian rice pudding is probably one of the more simpler Indian desserts to make. Creamy and velvety in texture this milky delicacy always goes down well with children and adults alike. It’s traditionally made at festivals and weddings and every region of India has their own way of preparing kheer. The fundamental ingredients are milk and sugar. This recipe, courtesy of Mama Sawhney, originates from Northern India where rice is used to make kheer but vermicelli can also be used. Best served chilled! In a pan, add the milk and cardamom powder and bring to boil. Now add the rice and saffron and reduce the heat. Continue to simmer on low heat, stirring from time to time to prevent the rice from sticking to the bottom of the pan. Simmer, stirring occasionally, until the milk is reduced by about half (this can take up to 1¼ hours). Add the sugar and raisins and stir well. Continue to simmer for a further 15 minutes, stirring continuously. Turn off the heat. Wait till it cools down and place in fridge. I always chill it overnight before I serve. If the kheer becomes thick, you can add some cold milk before serving and stir well. Garnish with chopped pistachios and almonds. Recipe shown below serves 12. You can either divide by how many servings you want it to yield or use http://www.easysurf.cc/recipe.htm. In a bowl: Mix together the lamb and all of the ingredients listed above under the ‘marinade’ title. Refridgerate overnight. Preheat the oven to 170 C.
In a large open pan, heat the olive oil. Fry off the onions until golden and tender. Remove and grind in a food processor. Heat 3 tbsp olive oil in an oven proof pan. Add the whole spices listed above. when they begin to sizzle, add the ginger and garlic. Mix well and add the remaining ground spices and salt. Cook for a couple of minutes whilst stirring. Now add the ground onion paste to the pan as well as the green chillies. Mix well and cook on medium heat for 3-5 minutes , stirring every couple of minutes. Now add the tomatos and fresh corriander. Cook the masala for a few minutes until the oil begins to separate. Now add the marinated lamb and mix well. Add 2 glasses of water to the lamb masala and place in the oven. Check the lamb and stir it every 10 minutes. When you do this,if you think the gravy (masala) has thickened, you add some more water. Keep an eye on the lamb curry and cook until the lamb is tender (I cooked it for about 3 hours). Once tender (you can tell if the lamb is fully cooked if it breaks apart easily) add the spinach and mix well until it blends with the masala. Remove from oven. (NB. You can remove the whole spices from the lamb curry if you want). Garnish with cream and fresh coriander. Hi! 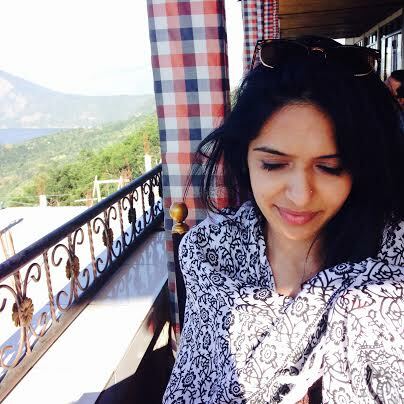 I'm Monica and welcome to my Spice Diary...a collection of my recipes & food related thoughts!